Be the first to review this 2019 Honda HR-V. The Honda HR-V is a subcompact crossover with available all-wheel drive that’s based on the brilliant Honda Fit. In its fourth year, for 2019 it gets a styling tweak that doesn’t change its overall looks much. It gains two new models including a Sport with zippy 18-inch alloy wheels and black trim, which allows it to step out of its economy role just a bit. New active safety equipment has been added as well, as in other Honda models. EX and higher trims now come with a bundle of collision-avoidance technology including automatic emergency braking, adaptive cruise control, and active lane control. The new Touring model is fitted with navigation, a power driver’s seat, and LED headlamps. Like the versatile and popular Fit, the HR-V uses a fold-flat 60/40 rear seat, and fold-flat front seats. Every HR-V uses a 1.8-liter four-cylinder engine making 141 horsepower and 121 pound-feet of torque. It feels quick enough around town, but runs out of juice on the highway, where at least the handling is decent and the ride is comfortable. For 2019 the manual transmission has been replaced by a competent and well-tuned continuously variable transmission. The HR-V’s tidy 102.8-inch wheelbase and short 170-inch length allow it to be quite nimble. And the short wheelbase doesn’t deter from a compliant ride. Suspension engineers did a great job on the HR-V. The 2019 HR-V is EPA-rated at 28 mpg city, 34 highway, 30 combined for front-wheel drive, and 1 less combined mpg for all-wheel drive. Safety scores are good. The NHTSA rated the HR-V at five stars overall, with four stars for rollover and four stars for frontal crash performance. The IIHS rated it “Good” in most tests, and “Acceptable” in the small-overlap test, but gave it a “Poor” for the headlights. We’re hoping the new available LED headlamps are better. The LX comes with cloth upholstery, air conditioning, tilt-and-telescoping steering column, Bluetooth, a 5.0-inch color display, four-speaker 160-watt audio system, single USB port, auxiliary audio jack, and 17-inch alloy wheels. EX ($23,720) adds sunroof, fog lights, automatic climate control, heated front seats, six-speaker 180-watt stereo system, 7.0-inch display screen, a second USB port, and a right-side rearview camera. EX-L ($25,320) adds leather, navigation with voice recognition and real-time traffic, HD radio, and satellite radio. The new HR-V Sport is $22,220, and the new fully-loaded Touring is $28,540. Safety equipment on all models includes a multi-angle rearview camera. EX and above get automatic emergency braking, adaptive cruise control, and active lane control. The 2019 Honda HR-V has a blunt but perky body. It’s a blend of hatchback and coupe that’s smooth enough but not particularly compelling. 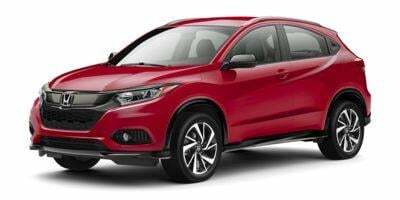 From the front it resembles the larger CR-V, but with a wider front grille and a stronger nose. From the side, the curved roofline that gives more headroom is capped by a roof spoiler. A sharp, rising character line runs from the door up into the D-pillar. In the rear, a strong crease swoops from the outside of each tail light, creating a wide grin. But the real massive swoop is stamped into the sheetmetal on the sides, moving forward into the grille at one end and digging into the rear door handles at the other. It’s definitely not dull. In contrast to the busy exterior, the interior is tidy and well organized, with a nice center stack and optional big display. A wide swath of soft-touch material dresses up the dashboard, although a trio of slim air vents in front of the passenger feel like an afterthought. Most trims feature cloth or vinyl trim on the door panels that helps them avoid the cheap look and feel of hard plastics found in so many subcompact crossover SUVs. Most trims also use a 7.0-inch touchscreen for infotainment (now with a volume knob rather than last year’s slider) that’s integrated nicely into the design, perfectly located in the high center console, that helps separate the driver from the front passenger. The haptic automatic climate controls on EX and higher trims look flashy but can be frustrating to use. Below the center stack there’s a small storage space that can fit a phone, with a USB port. The HR-V’s front seats are quite comfortable, with a fine fabric, but the seat bases could be longer and the available moonroof cuts into head room. The leather on the top EX-L model feels somewhat stiff. The rear passengers have superb head, hip and legroom, partly thanks to the feature that Honda calls Magic Seat. The 60/40 bench is hinged to allow the bottom to fold upward like a lawn chair, creating a low load floor directly behind the front seats. When the backrests are folded down, the HR-V has a flat cargo area long enough for six-footers to sleep in. Even with its short 170-inch length, the HR-V’s 24.3 cargo space behind the rear seat is more like a compact than subcompact crossover. And with the rear seat folded, it more than doubles to a massive 58.8 cubic feet in an area that’s square and flat. Compare that to the Chevy Trax, with 18.7 cubic feet and 48.4 cubic feet. If you go by total interior space, more than 100 cubic feet, the HR-V is the roomiest vehicle of its kind. The 1.8-liter engine is smooth and works well with the continuously variable transmission (CVT), but it has just 141 horsepower and 121 pound-feet of torque on tap. The HR-V isn’t heavy, being a subcompact, but neither is it light, at more than 3,000 pounds. On the highway, the engine works hard to extract all the power it can. The CVT is slower to shift than a conventional automatic. The HR-V has nimble handling, and its steering is quick and responsive. It confidently slices through curvy roads. It also has a compliant ride. It never feels brittle, the body motions are well controlled, and it takes city potholes in stride. The 2019 Honda HR-V isn’t a quick, sporty hatchback, but it’s efficient in fuel use and especially in space. It has some specific and awesome upsides: price, fuel economy, clean cabin with vast space and versatility, precise if relaxed handling, and a very comfortable ride.